The pre-release event of Power Star Pawan Kalyan’s soon to be released action entertainer, Katamarayudu, was held in a grand fashion last night. Pawan spoke for nearly half an hour and gave an impressive speech filled with humility and modesty that touched his fans. Pawan said that he believes that his brother Chiranjeevi is the real hero and that he won’t consider himself as the hero. 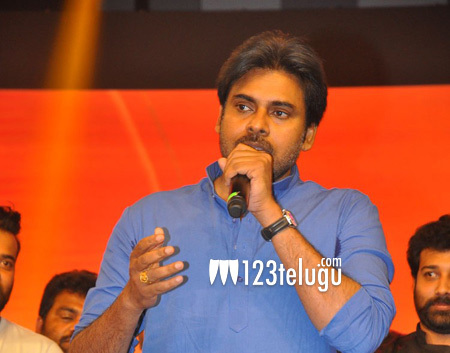 Pawan said that his fans are his true life. The actor then reminisced his 20-year-old career and recollected several memorable and bitter moments in his journey to stardom. The event was graced by Pawan’s good friend and director Trivikram Srinivas, TV9 honcho Ravi Prakash, producer Bandla Ganesh and several others. Katamarayudu releases on March 24th.